This is a classic New England-style crab cake recipe, completely with tangy Dijon-Horseradish sauce to go with. So what does one do with extra steamed blue crabs because you are too full to eat another bite? Pick those suckers clean to get the meat for crab cakes! Last post, I introduced you to our family tradition where one night a week, we go a little seafood crazy. And sometimes, of course, our eyes at the market are bigger than our stomachs later that evening. With those Classic Steamed Blue Crabs, this is precisely what happened. And this was totally fine with me because crab cakes are just about one of my favorite favorite foods. OK, so I think crab cakes are no-joke, serious business. Seriously. I’m talking about the age-old debate …how much filler should there be? You know, the stuff in the cakes other than the crab itself. …I am from New England. We like filler. My husband is from Maryland …minimal filler. But when I lived in Maryland and had crab cakes with like zilch filler, they were basically fried balls of straight pure crab. These were not tasty. …Yes, I did. I do not like Maryland crab cakes. But guess what – up nawth, folks get overzealous with the ingredients and go heavy-handed with the filler and that doesn’t work for me either. New England, I luv ya – but bell pepp-ah has no place in crab cakes. And they shouldn’t be mostly breading eith-ah. So my solution is to take the best of both worlds. I add filler, but I keep it simple. I use lump blue crab. A little herb, a little seasoning, some panko (because panko holds up better and doesn’t get grainy like dried breadcrumbs or pasty like fresh breadcrumbs), and some egg to bind it together – and there you have it! Top with a traditional aioli, and now we’re talking. In a snap, this recipe produces crab cakes that are totally restaurant quality. So incredibly delicious with just the right balance of ingredients …and filler. Combine the ingredients for the aioli in a small bowl. Chill until ready to serve. In a bowl, combine all the ingredients up to and including the egg. Toss together lightly with a fork so that the crab doesn't completely break apart. Using your hands, form the crab mixture into 8 patties. Heat a large, nonstick over medium-high heat. Add the butter and olive oil, and wait for the butter to stop frothing. Using your hands, take a palmful of the crab mixture and form into a patty. Gently lay 4 formed crab cakes into the oil and cook until browned on one side. Gently flip over each crab cake and brown the other side. Remove to a plate. Cook the remaining 4 crab cakes. Serve with Dijon-Horseradish Aioli and fresh squeezed lemon. Yield: 8 crab cakes; 4 servings. These look absolutely delicious Erica! Um…. yes I think I’ll try this! they look so yummy! love crab season…. Totally agree, too much filler makes me just not want to eat them…your recipe sounds delicious! 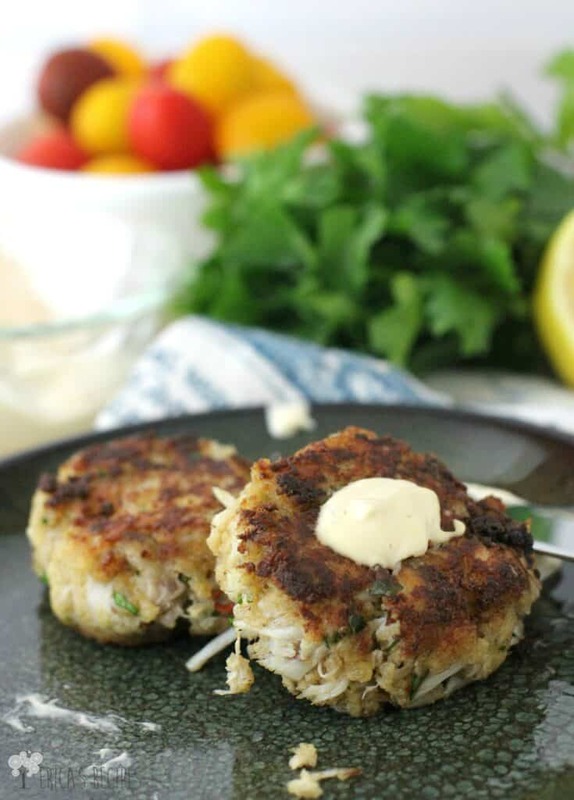 These crab cakes looks absolutely delicious…I can’t wait to try to make these! These look delicious Erica. Like you, I don’t want a lot of filler in my crab cakes. I want to taste the crab. I love it! 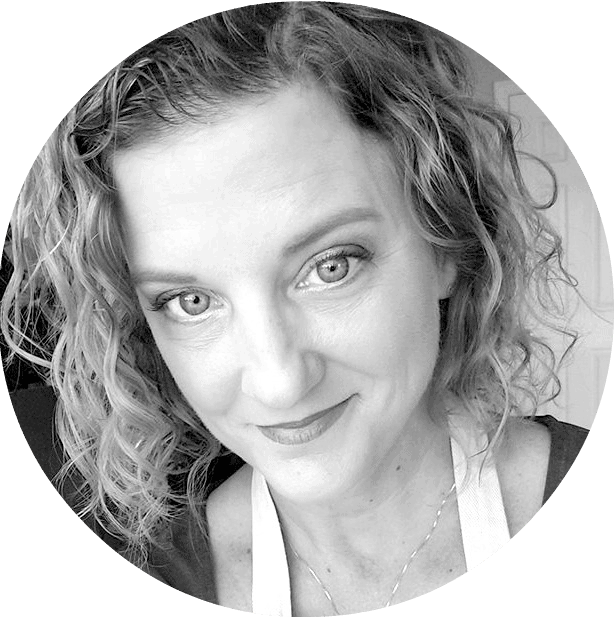 Finding a happy medium by keeping it simple! Works for me – I love to ‘keep it simple’ in the kitchen 🙂 Great way to repurpose those leftovers! Oh my word. YUM! I’ll just come over and have some of those you made, because they look pretty darn perfect! 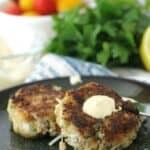 I’ve always wanted to make crab cakes at home and these ones look fantastic, especially with that aioli! I will have to try this!! Oh my, those sound delicious. And the sauce… yummmmm! Found you on Wine’d Down Wednesday. Erica these look amazing, and your photos are so crisp and clear! Love all around. I’ve never made crab cakes, but this is motivating me to try! My family loves seafood. New follower here! I like my crab cakes “crabby” too 🙂 I think you got this one just right! 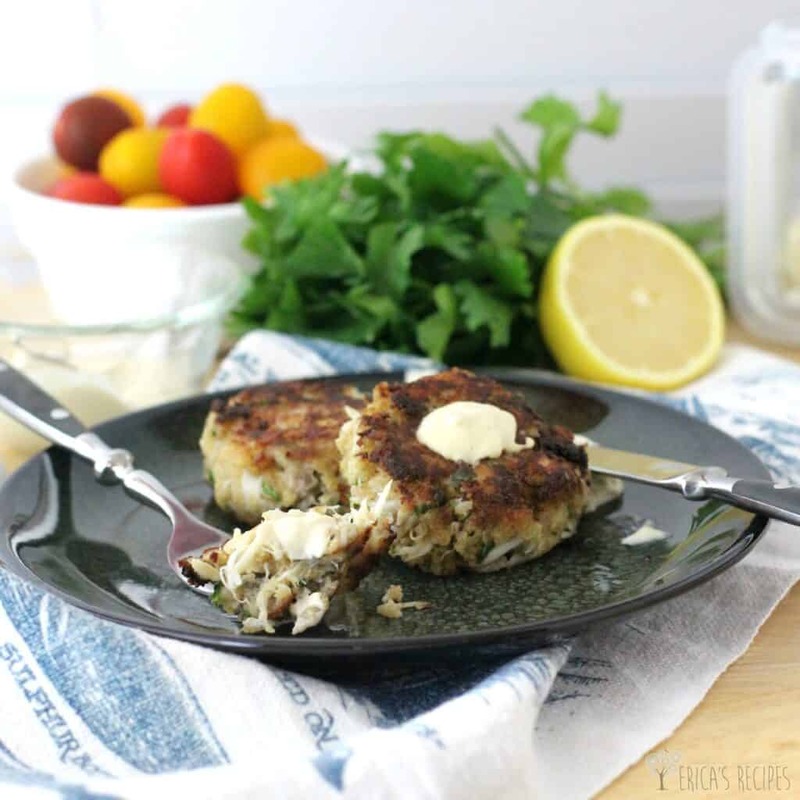 I love crab cakes but have never made them – I’m excited to have a recipe to try! These look like perfection! Beautiful photos too! I absolutely love crab cakes and cannot wait to try these Erica! They look delicious! Pinning! Thanks so much for sharing it with us at Foodie Fridays!